Networking is critical in MySQL, it is a fundamental resource to manage access to the server from client applications and other replication peers. 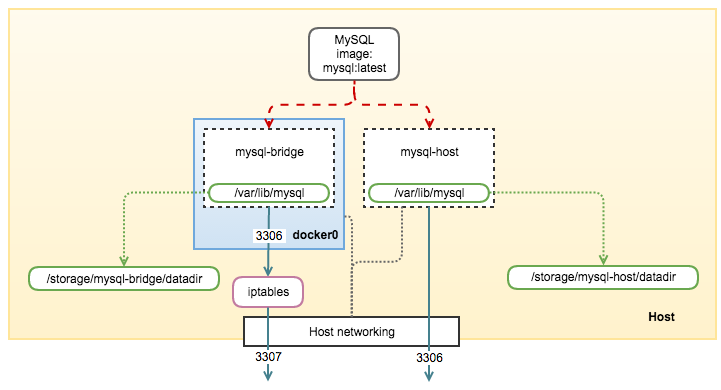 The behaviour of a containerized MySQL service is determined by how the MySQL image is spawned with “docker run” command. 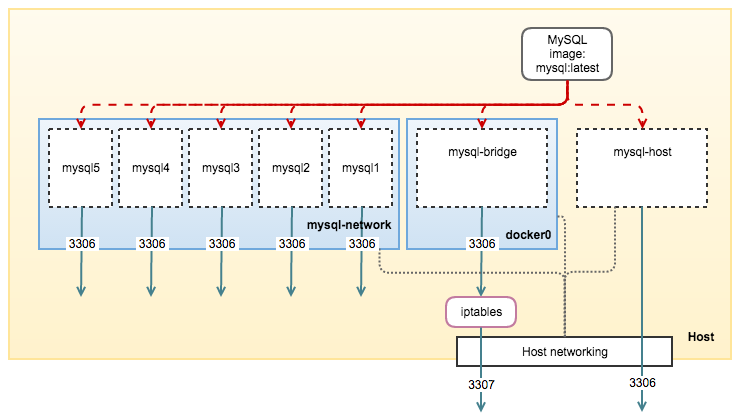 With Docker single-host networking, a MySQL container can be run in an isolated environment (only reachable by containers in the same network), or an open environment (where the MySQL service is totally exposed to the outside world) or the instance simply runs with no network at all. In the previous two blog posts, we covered the basics of running MySQL in a container and how to build a custom MySQL image. In today’s post, we are going to cover the basics of how Docker handles single-host networking and how MySQL containers can leverage that. Each network driver has its own characteristic, explained in the next sections. Container’s network interfaces will be identical with the machine host. Only one host network per machine host. You can’t create more. You have to explicitly specify “--net=host” in the “docker run” command line to assign a container to this network. Container linking, “--link mysql-container:mysql” is not supported. Port mapping, “-p 3307:3306” is not supported. In this setup, the container does not need any forwarding rules in iptables since it’s already attached to the same network as the host. Hence, port mapping using option “-p” is not supported and Docker will not manage the firewall rules of containers that run in this type of network. Having a MySQL container running on the Docker host network is similar to having a standard MySQL server installed on the host machine. This is only helpful if you want to dedicate the host machine as a MySQL server, however managed by Docker instead. Containers created on host network are reachable by containers created inside the default docker0 and user-defined bridge. Bridging allows multiple networks to communicate independently while keep separated on the same physical host. You may imagine this is similar to another internal network inside the host machine. Only containers in the same network can reach each other including the host machine. If the host machine can reach the outside world, so can the containers. The default bridge network, docker0 will be automatically created by Docker upon installation. You can verify this by using the “ifconfig” or “ip a” command. The default IP range is 172.17.0.1/16 and you can change this inside /etc/default/docker (Debian) or /etc/sysconfig/docker (RedHat). Refer to Docker documentation if you would like to change this. The default bridge network supports the use of port mapping and container linking to allow communication between containers in the docker0 network. If you would like to link another container, you can use the “--link” option in the “docker run” command line. Docker documentation provides extensive details on how the container linking works by exposing environment variables and auto-configured host mapping through /etc/hosts file. Docker allows us to create custom bridge network, a.k.a user-defined bridge network (you can also create user-defined overlay network, but we are going to cover that in the next blog post). It behaves exactly like the docker0 network, where each container in the network can immediately communicate with other containers in the network. Though, the network itself isolates the containers from external networks. 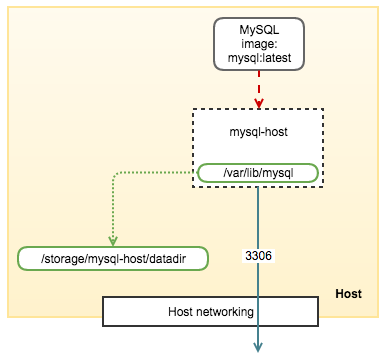 The embedded DNS server maintains the mapping between the container name and its IP address, on the network the container is connected to, as in this case it is mysql-network. This feature facilitates node discovery in the network and is extremely useful in building a cluster of MySQL containers using MySQL clustering technology like MySQL replication, Galera Cluster or MySQL Cluster. Name resolver Not supported (unless you link them) All containers in this network are able to resolve each other’s container name to IP address. Version <1.10 use /etc/hosts, >=1.10 use embedded DNS server. We can also create a container without any network attached to it by specifying “--net=none” in the “docker run” command. The container is only accessible through interactive shell. No additional network interface will be configured on the node. Example use cases to run MySQL container in this network are MySQL backup verification by testing the restoration process, preparing the backup created using, e.g., Percona Xtrabackup or testing queries on different version of MySQL servers. This concludes today’s blog. In the next blog post, we are going to look into multiple host networking (using overlay networks) together with Docker Swarm, an orchestration tool to manage containers on multiple machine hosts.